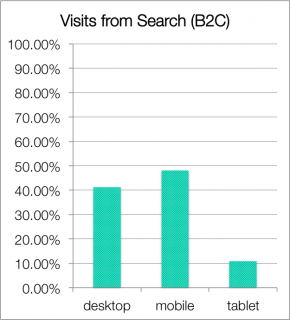 Will Mobile Search Surpass Desktop Search in 2014? Mobile may hit a major milestone this year. Matt Cutts, the head of the webspam team at Google, recently stated he wouldn’t be surprised to see mobile queries surpass desktop by the end of 2014. Based on current numbers, that seems somewhat shocking. Mobile searches could outweigh desktop in just eight months? So if that prediction does come to pass, what will that actually amount to for most businesses? First, keep in mind that statement is from Google’s perspective. Those are strictly queries on Google, not queries that send visitors to a given website. So don’t expect to look in analytics and see over 50% of organic traffic from mobile in December 2014—though you might. Some websites are already at or beyond those rates, but not many. Also consider that what we search for on mobile is often different from what we search for on desktop. Think of all the searches for movie times, or where the closest pizza place is, or what year so-and-so was born in. Think of all the questions that arise in conversation that somebody might end up searching for on Google or Bing. The search results page (or Siri or whatever) will answer many of those queries directly with the knowledge graph or some other feature. Even so, queries sending mobile users through to websites (and away from Google) are of course growing exponentially as well. On RocketFuel’s website, March 2014 has seen about 620% more unique visitors from mobile search than March 2013. 620%. But I honestly can’t imagine looking in analytics eight months from now and seeing the majority of search traffic coming from mobile for nearly all of our clients. (Granted, that statement only pertains to our client base.) 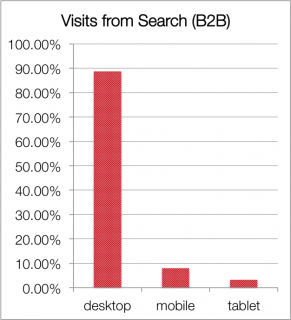 Even with 620% growth from mobile search, we still get ten times as many visits from desktop searches. The writing is on the wall, though. Last week, I was going over some analytics data with a client. She suspected her website probably wouldn’t see much traffic from smartphones and tablets. 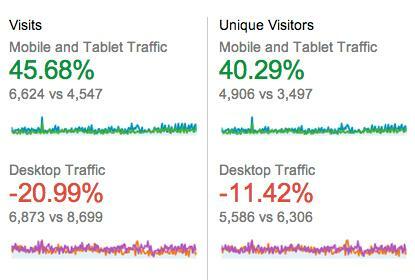 So it was somewhat surprising to see the website was getting around 40% of its traffic from mobile and tablets. In fact, mobile and tablet traffic had grown about 85% in the past year. The user demographics—presumably older and with good reason to visit the website from the office—did not fit the mold for a tech-savvy, multi-device audience. Especially not for mobile visits. That’s a strong signal that the people we thought previously were not using smartphones and tablets now are, and are starting to prefer them to desktop. On most websites I’ve sifted through, mobile search has certainly made major leaps and bounds in the past year. Anecdotally, mobile search increased anywhere from 60% to 150% in 2013 compared to 2012. For service industry websites, traffic from mobile search saw massive growth while desktop search traffic slumped, or in some cases, dropped year over year. The bad news is that B2C websites—particularly restaurants—are starting to see some significant dropoff in traffic from desktop devices. The good news is that mobile and tablet growth is outpacing the losses from desktop. The practical reverberations of this will probably be some seriously stripped down websites. Stop the presses for now though. Even with all the growth in mobile search, it was usually only about 10% of what desktop search sends to most websites I looked at. In some rare instances it outpaced visits from desktop searches. So there’s still a ton of ground to make up before most websites see the majority of their traffic come from mobile—especially search traffic. If anything, Matt Cutts’ comment goes to show just how many mobile queries never leave Google’s results or go to 3rd party sites like Yelp. So whether or not mobile queries surpass desktop this year, don’t expect that sea change to affect your website’s traffic as seriously as it might sound… for now anyway.